MIGNONNE: Bon Voyage to Kimberlee! I'm leaving for my big French adventure! 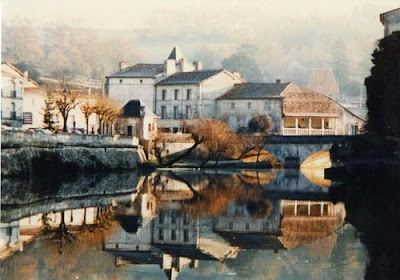 I depart early Saturday morning for Brantôme, a quaint village in the Dordogne know as the "Venice of the Perigord". Brantôme is less than an hour drive from Bordeaux and is located in an area rich with history and beauty. With its "gastronomique" specialities, (foie gras, truffles, duck), the Dordogne is where foodies can savor the experience of fabulous cuisine and culinary delights. The region also boasts some wonderful outdoor activities such as biking, horse riding, kayaking, camping, fishing and generall appreciation of the natural beauty. The heart of mankind, Lascaux Caves, are a short ride away. I am SO looking forward to enjoying the pleasures of a simpler life and the chance to escape from the stress and bustle of urban living and corporate pursuits. Hopefully I will find time to stroll through some of the old villages and visit the markets full of smells and sights most of us have thought long ago disappeared. My life will be anything but quiet, however, with my long list of many projects, including fixing up a 17c stone house, exploring my own new village, greatly improving my French, spending time expanding Mignonne's online shopping capabilities and writing the Je Suis Mignonne blog as well as my own personal blog ... and very importantly, searching for treasures to send back to Mignonne. Not only is the region known for its gastronomique qualities, but it is teeming with brocantes and hidden treasures just awaiting discovery. Johnelle and I are very excited to have this opportunity to bring a splash of France directly to our customers in Old Oakland. Wish me a big bonne chance!